Is anyone hungry? Well, did you know that like our stomachs, our souls get hungry! Jesus reminds us of this hunger when He says: “Man shall not live by bread alone, but by every word that proceeds from the mouth of God” [Matthew 4:4]. That word that proceeds from the mouth of God is made available to us through Sacred Scripture and the teachings of our Catholic faith. We want to share with you a great tool to build a holy habit into your life that will give your soul nourishment every day. That tool is FORMED on your phone. FORMED is an amazing website with something for all ages: movies, video studies, an audio bible, audiobooks, testimonies and other inspiring talks, and e-books. 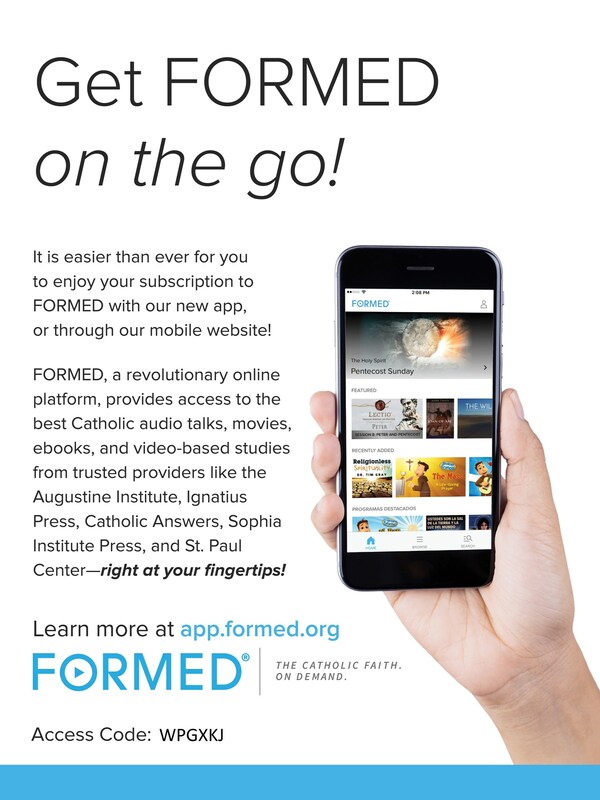 And, FORMED has a app so that you can have spiritual food available with just 1 click, anytime and anywhere!